Stainless steel Raymond Weil Tradition 5966-ST-00970 watch, water resistance to 50m, with date. Water Resistant: 50 M / 165 FT Shipping Free Shipping with Insurance Continental US! 18K Rose Gold & PVD Steel Bell & Ross Marine 92 BR02-BICOLOR watch, water resistance to 1000m, with date and nylon strap. Stainless steel Oris Artix 01 674 7644 4051-07 8 22 80 watch, water resistance to 100m, chronograph, with date. Stainless steel w/ black leather strap Oris Artix 01 674 7644 4054-07 5 22 81FC watch, water resistance to 100m, chronograph, with date. 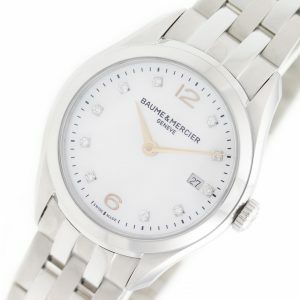 Stainless steel Baume & Mercier Clifton MOA10176 watch, water resistance to 50m, with date and diamond indexes.